Nestled in the foothills of the Tatras, Zakopane is Poland’s best-known mountain resort. Zakopane is known for the size and beauty of its wooden villas, dating from the late 19th and early 20th centuries. Some of these now house museums, while others have been converted into hotels or pensions, or remain in private hands. 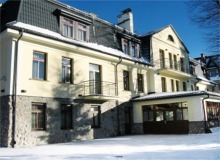 We offer disabled holidays in Zakopane in amazing accessible accommodation. The Patria Hotel is situated in the quiet centre of Zakopane in the neighbourhood of The Great Krokiew, Tatra National Park and Krupówki Street. he hotel contain plenty of facilities for guest of all ages including kid’s area, gym, sunbeds, restaurants and many more.